Large veggies like tomatoes CAN be grown in a container! 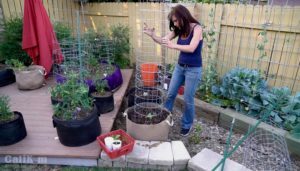 If you are growing in a small space, like a patio or deck, you might think that you can’t grow large vegetables such as tomatoes, squash, eggplant or watermelon. Not so! With a few quick and simple tips, you CAN grow large vegetables successfully in a small growing space – in containers! Bring on those fresh, tasty tomatoes, ton’s of squash, and yes, even juicy watermelon. You’ll be growing some in no time on your own on a patio or balcony. Chose a container that is big enough for the root system to develop. When you’re growing a large vegetable that is a “heavy feeder” (requires a lot of nutrients to be productive) it is important to chose a container that is big enough to accommodate an extensive root system and still allow the plant to uptake the water and nutrients it needs. If you grow in a container that is too small, your large veggie will not have the space it needs to grow and be productive for you. I like to grow my large container veggies in 20 gallon Smart Pots fabric containers. Besides being available in a variety of sizes (large and small) Smart Pots are made from a super-durable, aerated material that allows the roots to “air prune”. 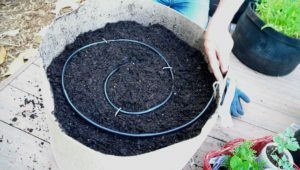 Rather than circling around when they hit the sides and bottom of the container, and getting root bound, the roots prune themselves, and develop a fibrous root system that is still able to take up water and nutrients. Thus, a large veggie will keep growing and be productive, even though it is in a container. Chose soil that is full of nutrients and retains water. Containers tend to dry out quicker than an in-ground garden. 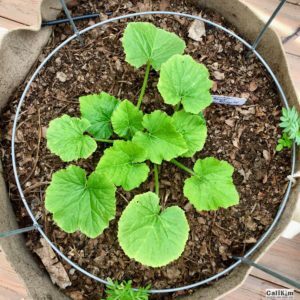 Because large veggies are typically heavy feeders, it is important to choose a high quality potting mix that is moisture retentive, and has lots of organic nutrients. 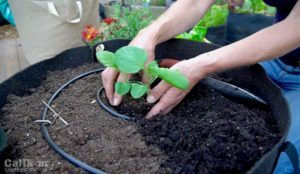 Some options for potting soil are to make your own, purchase in bulk, or use a high quality, moisture retentive bagged mix that is full of organic nutrients. Before planting, fill your container with soil and pre-moisten the mix until it is the consistency of crumbly brownie mix, but not overly wet. I also like to add my own special organic nutrients to the potting mix to help these heavy feeder plants get off to a strong start. Vermisterra worm castings, Trifecta + are my go to organic fertilizers of choice. (Receive a discount when you purchase through these links). Both are powerful, organic fertilizers that will give my plants the nutrients they need right away, and feed them long term over the growing season. To 20 gallon container, I add 1 cup of worm castings and 1/4 cup Trifecta+. Work in to the soil and you are ready for the next step! A container drip irrigation system is easy to install and is key to a productive garden. One of the keys to a productive garden is consistent watering. 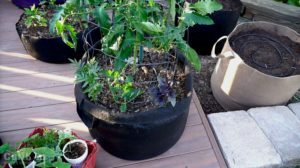 I installed a separate drip irrigation system just for my containers to make sure that they get the regular watering they need. I don’t have to worry if I forget to water, or go on vacation. My veggies are getting what they need to be productive! Don’t be intimidated by drip irrigation. It is quick and easy to install, and inexpensive too! I’ve used DIG irrigation in my garden for years and installed a DIG raised bed kit for my containers. It has everything you need to get started, and you can even expand on it later, if you like. 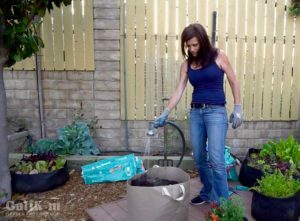 Watch this video from my YouTube channel “How to Install Drip Irrigation in Containers” so you know exactly what to do. Water your newly planted seedling with worm tea, cover the soil with mulch and it is good to grow! With the right container, soil, watering, and proper support in place, you are now all set to get those yummy veggies in your containers. It will be so fun to nurture them, see them grow and harvest lots to share with your family and those you love. Nothing like the last of garden fresh, don’t you agree? When planting your large veggie seedling, dig a hole a bit deeper and wider than the container your seedling is in. Carefully grasp the seedling by the stem, turn the container over, gently squeezing the plant to loosen it. Place the seedling in the hole you dug, fill with soil and tamp down firmly around your plant. I like to give my seedlings a nice drink of Vermisterra Worm Tea, which is helps the roots grow, mulch with an inch or so of shredded leaf mulch, and my plant is good to grow! Growing UP not OUT makes the most of your garden space. I like to make the most of my garden space by growing UP, not OUT. It’s easy to install a simple trellis to support your plants and save space. I like to use my DIY tomato cages to support the taller plants, like tomatoes and watermelon. Large tomato cages purchased at the garden center work well to support squash, and eggplant. Watch the video from my YouTube channel, “Growing Large Veggies in Containers” so you know exactly what to do and to see what varieties I am growing! Comment below – let me know what veggies you are growing in your container garden! I think this has convinced me that we need to start growing UP! We have a small California back yard and when we plant squash or watermelon, they take over! Right now I have an elevated plot (on legs) where I have planted some Boston Pickling Cucumbers. My husbad installed a hand-made ladder next to the plants so they will have a place to climb. Can’t wait to see how they turn out. I’m very new at gardening so everything is a surprise to me! Thanks for watching- happy gardening! Great article. Just what I needed today as I was deciding if I should start growing watermelon but was concerned about the small space I have. I’ve been wanting too for a while but have always decided NO when holding the seeds (lol). You read my mind, I swear. Thank you for encouraging me to just go for it. Your guide is extremely concise and informative, I’ll definitely be following. So glad that you decided to go for it. I love growing watermelon- so fun and rewarding!! Keep me updated on how it goes- happy gardening! I have three raised beds. Soon into my gardening I discovered these just were not enuff. I have Home Depot buckets, holes drilled in for drainage, the many other containers are smart pots elevated to be sure they don’t sit in water. I have in pots/containers, some with trellis, some not so far, potatoes, onions, cucumbers, squash, bell peppers, beans, yellow, purple and green bush type, strawberries and even some corn. So what is in my raised beds you might ask? Haha! Well elephant garlic, more onions, potatoes, tomatoes, beans and squash. I even have an orange tree in a pot and it gave me over 30 wonderfully sweet, large oranges. I guess it is safe to say I have the gardening bug. It is just so great to sit down to a meal and know you grew part of it. I agree, CJ! Just simply so rewarding. Sounds like you have quite the garden production going there- love it! Thanks for stopping by to say hello- happy gardening! Growing vegetables in the container is really a good idea, can save much space at your gardening. I love to grow all type of vegetables and fruits in my garden, but always I lack in the space, anyway now I have adapted to some vertical gardening methods and has started with few plants, let me know how is this going to work for myself. Hello Irving – glad you are growing in containers – it’s such an easy way to grow and a huge space saver! Hope your container garden gives you lots of fruits and veggies this summer! Thanks for stopping by! Hi Calikim, I’m glad that I found your website. I used to go to “Farm Girl” until I found your blog. I own & run I own & run a pick your own fruit farm here close to Houston for many yrs. Now i’m going to try something different. I always wanted to grow blackberries but the work involved would take up almost all of my time. Soooo! I found that I have access to numerous 30 gal. molasses cattle containers. I’m going to try to grow thornless blackberry plants in them to eliminate weeding & difficultly in pruning. I plan on doing about 30 to start & see how they do. I plan on using peat moss, wood chips, potting soil & worms. ( I used to own a worm farm) I’m propagating B.B. plants now to use in the containers. Hopefully the worms will provide enough castings so I don’t have to add any other nutriments, or very little. If you’re interested, I’ll keep in touch & let you know how things turn out. Hi, Richard! Sounds like you have a great plan in place-Would love to hear how your farm continues to grow and produce. Keep me updated and happy gardening! Thanks for the brilliant content. I have shared it on my twitter page. Thanks for all your support and especially sharing the content- My hope is reach as many people as possible wanting to learn organic gardening! !